Last Saturday I headed away from sunny Oxfordshire and No.27 to East Sussex for a mini break away. We checked in at our stunning B&B, Oakdown Court in Burwash Common and settled down for the night after a meal at the local pub, The Wheel Inn. I awoke early and headed downstairs for a delicious cooked breakfast; eggs, bacon, sausages, tomatoes, mushrooms and beans, the lot! Oh how scrummy it tasted! Once ready to get outside and go, I decided to take a visit to Sarah Raven’s Perch Hill which was only a 5 minute drive away to see if by any chance the shop was open. Look who I bumped into! Ok, maybe that’s not quite true but imagine if it was…how lucky would that be and what a story?! It didn’t quite happen like that but I was that incredibly lucky! Monty is not just a gardener and the front man of BBC Gardeners World, he is the epitome of a true wise gentleman and an inspiration to many including myself. His calming presence, his charm and his ability to make you realise you can do anything, it is something special. I sent this photo to my Nan earlier and she was just as giddy as I was, what I loved though other than her excitement was her comment that I look intelligently beautiful and happy. Not too excited or in shock, just right. Phew…I pulled it off in one take! So how did this photo actually happen I hear you ask, how does somebody get that lucky?! As you will have read if you follow me, in October I had the pleasure of seeing Montague live in Basingstoke, a wonderful birthday present and I’m sure you will agree, quite a lucky opportunity in itself. Well jump to Sunday and an even better birthday present finally became realised. 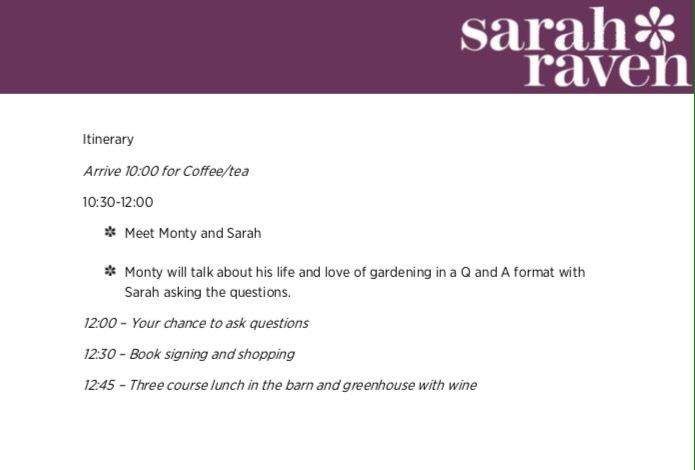 I remember looking up and down at the unwrapped letter from Sarah Raven inviting me to A Morning with Monty Don at Perch Hill in amazement. Are you sure? Really? 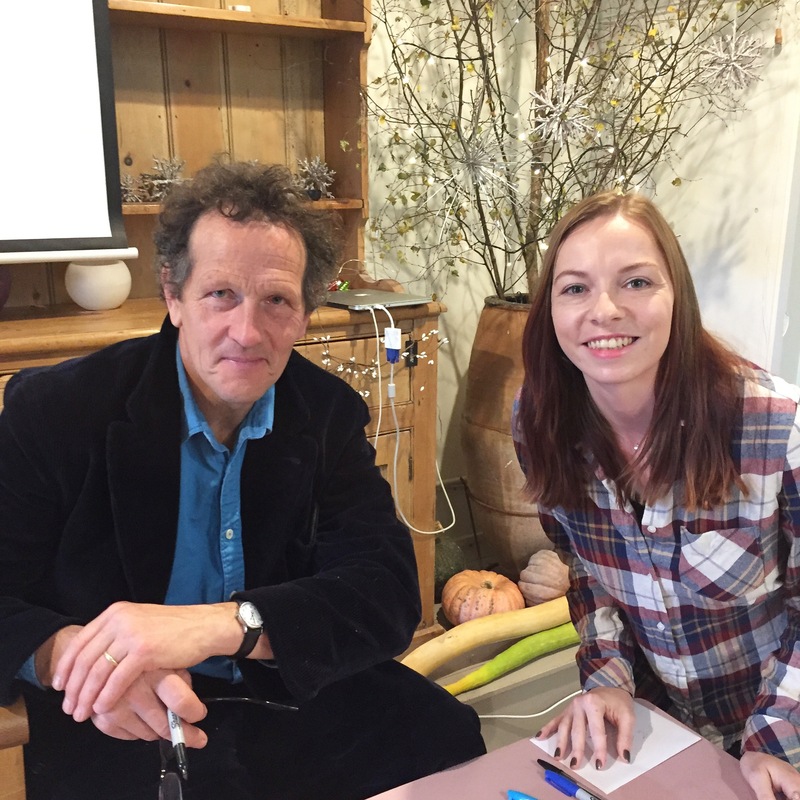 Am I actually going to meet Monty Don?! I think I just repeated these questions over and over again until it sank in, but I still don’t that it has really. There isn’t many people in the world that have this effect on others, it’s cheesy I know but we all have that small list of people we admire tremendously. Other than the bumping into him the rest of the initial story was pretty accurate, the B&B was stunning and the breakfast was definitely delicious. I certainly reccommend staying here if you want a relaxing break near Perch Hill, Batemans, home of Rudyard Kipling, The Walled Nursery, Sissinghurst and Great Dixter. I left the B&B at 9:40 and was warned by our very kind hosts to be careful on the road leading the Perch Hill. The exact words were “if you see a car coming towards you, get in any lay-by as quick as you can”. Now that I have driven down this very windy single road I pass those very wise words of wisdom on to you. I arrived safely and headed inside the school entrance where I was greeted and escorted through the shop to the greenhouse for tea and homemade ginger biscuits. 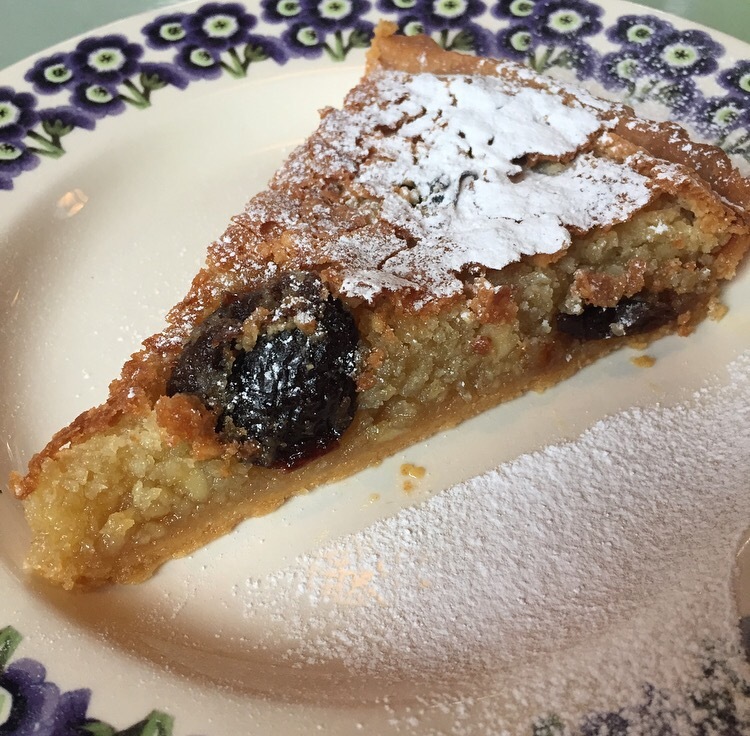 You will notice they don’t mention these cheeky delights on the itinerary. Sarah Raven promptly arrived at 10:30am and took us, the 50 trying to stay calm (probably just talking about myself) Monty fans in to the main room to take our seats. Everyone was edging towards the back few rows, I couldn’t quite understand this madness and headed straight to the front row. Monty walked in the door and the room fell silent, pure calmness and full of smiles. He started by recognising the absence of a certain very important individual, Nigel! He doesn’t do meet and greets apparently, too busy chasing bright yellow tennis balls with Nelly. I don’t blame him really either. The next hour and a half had the audience fully drawn into every word. Giving us the precious inside detailed view of Longmeadow, behind the scenes and its journey over the last 30 years. Next came the time to ask questions, which Sarah Raven very sensibly controlled so we didn’t all jump at once. I was delighted and felt very honoured when just before we started Monty’s wife Sarah joined us. Monty has always made it clear that the final decision of every plant and their positions lays with Sarah. A very wise move I say! The love, understanding and strength of their partnership is clear and a pure privilege to see. Whilst others were asking questions, from mischievous plants and overwhelming gardens to how to get your dog to walk behind a wheelbarrow, I was thinking, this is a massive opportunity. Don’t make a fool of yourself and ask something silly or let nerves get to you. The final question came and Sarah pointed to me, this is your moment woman, breathe and go for it! I explained my quick learning year long allotment journey, asked for his top grow your own tips and also his opinion on the much talked about ‘No-Dig’ method. I have been stuck on the fence with this method for a number of reasons recently, so I really valued his insight and was delighted to hear Monty’s view reflected mine. As Monty delivered his expert advice I explained what I have done to date in reflection to his questions. In his own words, “you are doing everything right already, you don’t need my help”. I chuckled and couldn’t thank him enough. Does a confidence boost get any better than that?! I don’t think so! The way Monty answered questions in the Q&A was very straight to the point, not rude but in a magical way that makes you chuckle and wonder why you ever doubted yourself. A round of applause erupted before we formed an orderly queue for book signings and photographs. The signing will be cherished forever and is one of a few; I won’t say anymore as there might be one getting wrapped up for Santa to deliver in a few weeks. Following a personal good luck from Monty I made my way to the barn which was beautifully decorated for the Autumn season, including silver painted pumpkins and the largest and most beautiful wreath I have ever seen. Set before us was a delicious three course meal, pumpkin soup, Moroccan lamb tagine and the finale, prune and frangipani tart with creme fraiche. With the last spoonful of desert devoured, a morning I will cherish forever sadly had to come to an end, but what a lifelong memory to have. One I still have to pinch myself actually happened. Will leave you with these final few words from Monty Don himself; Give love, share love and your garden will nurture it. Think of your garden as a story, tell it. Always remember dreams can and do come true. Now I would really like to read about your and Monty’s opinion on the ‘No-Dig’ method. Any chance?